2 Shampoos, 3 Blind Testers, 2 verdicts. A new theme for Skin Deep, today's post is a blind test. Skin Deep has put Rosemary Mint Shampoos, ideal for invigorating fine hair, on trial. So, what do you think? Would you like to see more blind tests on Skin Deep? 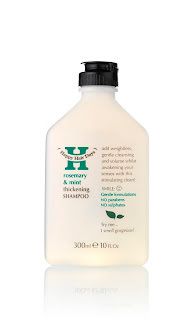 First up we have Aveda's bestselling Rosemary Mint Shampoo, which retails at £10.50 for 250ml. Testers described this as having a very strong mint fragrance and that it "left my hair feeling very soft and very shiny". It wasn't for everyone, with one of the testers stating, "my hair felt limp & flat. I would not want to use again" and another bemoaning the difficulty in rinsing out. 1 out of 3 testers preferred this. Next up, ﻿Happy Hair Days Rosemary & Mint Thickening Shampoo which is a budget friendly £3.99 for 300ml and boasts a paraben and SLS free formulation. Testers were wowed by the "fantastic, natural fragrance" which "definitely smells like rosemary". A tester with short hair stated, "After styling, my hair did not feel too weighed down as it can with non-volumising shampoos. My hair was soft but not flat. Would definitely use it again." SLS free shampoos do take some getting accustomed to however and one of the testers felt it wasn't for them, saying, "I found this difficult to rinse out & my hair was left feeling weighed down and greasy." 2 out of 3 testers preferred this. I think this is a great post idea, especially when comparing two different price points for similar beauty products. Thanks for your feedback. As requested, I'll be making this a monthly feature. Hope you like the future blind tests!